Is it possible to cheat in The Sims Mobile? 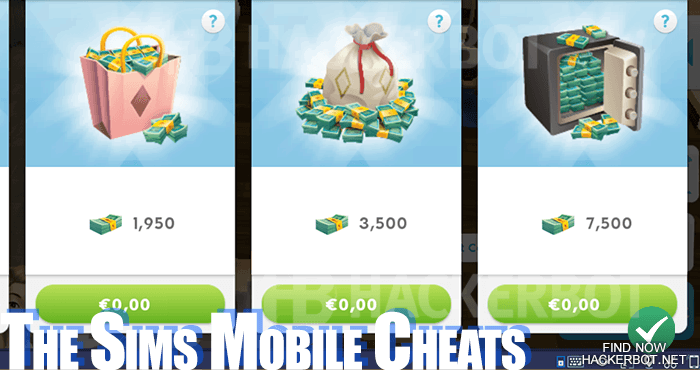 Cheating in The Sims Mobile is indeed possible using either game hacking tools, mods for Android or iOS or bots to automatically play the game for you and farm essentially unlimited Simoleons, SimCash and Tickets for you. 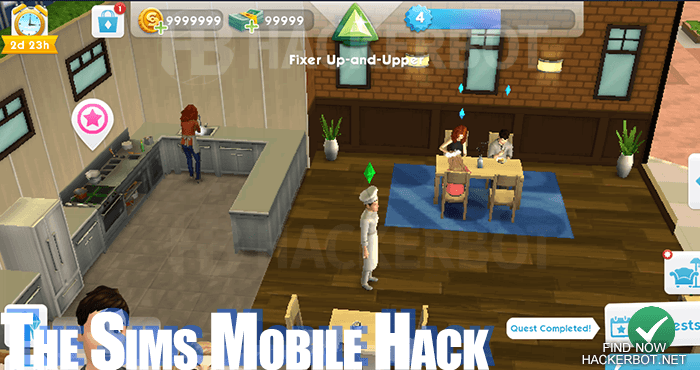 However, there is no direct hack for adding free SimCash or Money, because The Sims Mobile is an online game and saves your player data on the EA servers. Mods are the easiest way to hack this game. All you need is to download a modded game client for either Android (APK file) or for iOS (IPA file) and install it on your device. These modified game files for The Sims Mobile come with cheating options already hardcoded into the game itself, so there is no need to try and use various tools to change anything yourself. Mods are especially useful for utility, such as speeding up the game, disabling animations ect, which will make farming free SimCash and Simoleons a lot easier and a lot more time efficient. But as already mentioned, it is not possible to change your money or simcash in The Sims Mobile, because those values are stored on the game servers and only the developers, which means EA and Maxis can give you free simcash, money, tickets and chests or higher legacy score. Bots are arguably the most powerful cheating technique that you can use to essentially get free money in this game. A bot will be able to play the game for you and is either downloaded or created using emulators and macro editors. A bot can be taught or scripted to perform automatic game actions, such as completing events (job) for making simoleons / money, experience and tickets, it can be programmed to automatically join parties and perform possible actions, to join special events and to automatically open rewards and complete your daily to do list (daily quests or tasks). Over time a Sims Mobile bot can get you a huge amount of free simcash and simoleons by simply playing the game while you are at work, sleeping, at school or otherwise don’t have time to have your phone out, leaving you to enjoy the good parts of the game. However, if you need stuff quickly, you will still want to spend money to get those heirloom tickets, fashion gems ect. How to create your own Bot. The Sims Mobile Online Generators, Tools and Online Hacks – Legit? There are many people out there that are ‘offering free simcash and simoleons’, ‘hacks for unlimited money’ ect. But is it legit? No, it is not legit. As I have already pointed out multiple times, The Sims Mobile is an online mobile game and ‘online game’ means that your savegame is not on your device, aka your Android or iOS phone or tablet, which means those values cannot be hacked. If there was a way to get free simcash, then EA would stop making money from The Sims Mobile and would close down the game immediately to fix the problem. So really, the fact that the game is up, running ans successful is 100% proof that this kind of way of getting around the rules is not possible. Before downloading anything, make sure the mod you are about to use is the same version as the current game build. You can do this in your app info screen. Before downloading anything, make sure the hack has been confirmed working and up to date by multiple people in the comments within the last few days. 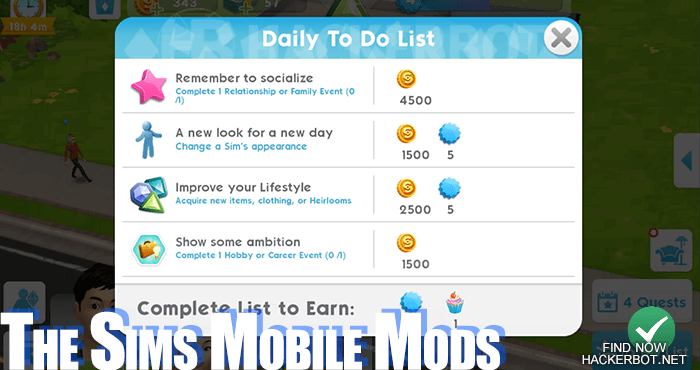 Before even considering a Download, please make sure that the mods and options advertised on a certain file are even possible for online games, such as The Sims Mobile. Ideally, use an emulator or old device that is connected to an alternate google / apple account and not your main personal account to test files first before actually using them on your main game account. Mods are without a doubt the easiest to-use and arguably the most effective way of cheating in The Sims Mobile at this time. However, finding legitimate downloads that actually are working and up to date is harder to do. What we recommend is using HackerBot FreeFinder, which is a custom search engine powered by Google that will search legitimate game hacking websites for mods and other cheating methods, allowing you to ignore all the gakes, human verification scams, sureveys, malware and so on. On top of making sure that you are using a legitimate website to download your Sims Mobile mods and hacks, you will also want to make sure that the files you are about to download are confirmed working by real people and confirmed clean and undetected within the last 24-48 hours. To make sure of this, watch the comments and replies in the threads where the mod files were uploaded. – This way you will keep your mobile device and your game account safe while cheating. 1 Any and all images and screenshots of games used on this page are used as a citation to illustrate cheats, what they look like and what they do, or what they could potentially do / look like, which is legal under swiss law. We claim no ownership of the original work. 2 Brand names, trademarks, logos and product names of games, their developers or publishers are merely referenced and they are the intellectual property of their respective owners. We claim no ownership for any of these IP’s, nor use them as our own brand.